Joy's really outdone herself, you know it? Look who's come to be interviewed this week. Yeah, so? It's just another author. JUST ANOTHER AUTHOR? Bytes to Gigabytes! Haven't you heard who's consented to be here? It's Trish Perry - don't you remember those other Harvest House books Joy's had filling her book shelves - you know those books that come and Jerry says, 'You bought another one of those books, Joy?! Oh, yeah. You're right, I remember her now. Is she bringing another one? She sure is but, hey, did you know she's written for other publishers too? Reeaally? Is she bringing those along with Tea For Two? No, but she may come back if we treat her right. Oh, here she comes - now act natural. RIGHT! I'm not the one going nut-so over Trish Perry - okay, okay - right. Don't wrinkle the keyboard. I'll behave. welcome to Joy's Joy~Ful Journaling. It's great to have you joining us for the Spring~Blog~Fest. my readers/followers with the short bio you've shared with me. Award-winning novelist Trish Perry has written Unforgettable (Summerside Press 2011), Tea For Two (Harvest House 2011), The Perfect Blend(2011), Sunset Beach (2009), Beach Dreams (2008), Too Good To Be True (2007), and The Guy I'm Not Dating (2006) all from Harvest House Publishers. 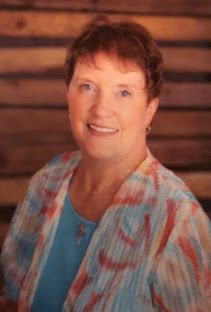 She teamed with four other notable authors in writing the 2011 Summerside Press devotionals Delight Yourself in the Lord (Even on Bad Hair Days) and God's Grace is Sufficient (But Decaf's NOT). Trish's monthly column, "Real Life is Stranger", appeared in Christian Fiction Online Magazi ne during its inaugural year. She was editor of Ink and the Spirit, the newsletter of Washington D.C.'s Capital Christian Writers organization (CCW), for seven years. Before her novels, Perry published numerous short stories, essays, devotionals, and poetry in Christian and general market media. Perry holds a B.A. in Psychology, was a 1980's stockbroker, and held positions at the Securities and Exchange Commission and in several Washington law firms. As a multi-talented business woman what prompted you to write? I began seriously writing novels in the early 1990's. For a few years before that I wrote smaller things, such as poems, personal essays, and devotions. When I started writing novels, I wrote a supernatural novel, simply because that's what the Lord put on my heart. But I didn't start publishing until I wrote my next novel, which was romantic comedy. 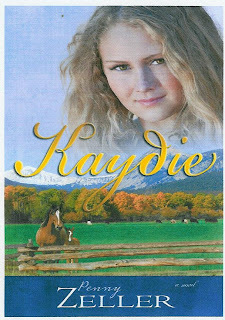 Now all of my novels are romantic, with humor laced throughout. I started the Tea With Millicent series at the suggestion of my editor at Harvest House. We decided to create a series involving different main characters in each book but with Millicent's Tea Shop as a setting that tied them all together. Tea For Two is the second in the series, and Milly Jewell is back again, dispensing yummy pastries, cozy tea, and learned advice. 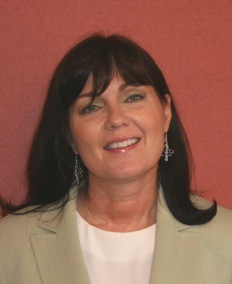 Tell us more about Trish Perry, the person. Trish Perry is my real name. With your degree, your many, many life experiences and all the fantastic writing you've done, how old are you? REALLY?! - I am single but have two children and one grandchild. I do love dogs but don't have any at the moment. What is your personal favorite reading material, Trish? Definitely novels, but I bounce from one genre to another. I like everything, both inspirational and mainstream, except maybe horror. Do you enjoy other hobbies or have other interests? I love watching and discussing films. I enjoy singing, and used to sing on my church's worship team until my schedule got in the way. I'm currently writing full-time. I'm training to do courtroom reporting, which will fit in well with my writing schedule, I think. Both endeavors involve a good deal of work at home, and they both allow me to call my own hours. What ONE thing do you want most out of life? I pray every day that the Lord will guide me to do what He has set before me to do. The one thing I want most out of life is to serve Him as He intends. Right now that seems to be through writing, but I'm always listening and watching, in case He wants to guide me elsewhere. Personal goal: To live a healthy life that always involves time with my friends and family. Writing goal: To accept every opportunity the Lord puts before me, trusting that He'll give me the time to meet deadlines and the wherewithal to be financially sound. Spiritual goal:To follow Him always and make Him proud of how I use the time He's given me. How can people learn more about you and your books, Trish? I'm always happy to hear from my readers. There's a contact page on my site, through which readers can send me emails. Wow, Trish, our time is spent and it seems we just got started. I appreciated the fact you were so willing to share about your life. It's been a blessing getting to know you beyond the many books of yours I've read. I was thrilled to be able to feature Trish and Tea For Two as one of my favorite hobbies is collecting 'tea-ing' paraphernalia; Unique-to-me pots, antique cups, tea bag holders, etc. My grandchildren have each been taught how to properly host and/or attend a formal or informal tea party (using recipes and hints from Emilie Barnes) - I've collected several of her books too. ;) So, this series holds a special place in my heart and life. When Milly, serves her shortbread cookies and other treats and offers the main character the lemon . . . let's just say, she had my own mouth watering - I had the Earl Grey but would have had to quit working/writing to bake the other goodies - oh my. . . You're gonna love this book - but be sure to get the entire series! 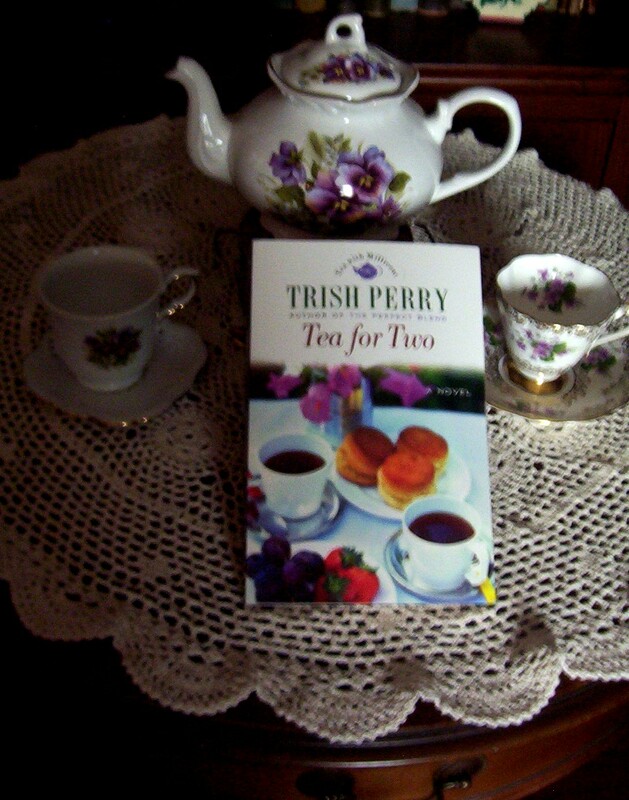 Trish has been kind enough to share openly and I have taken it upon myself to add the cover of her book - TEA FOR TWO - with a personal touch of my own. I've included the blurb from the back of the book. Counselor Tina Milano has been visiting Millicent's Tea Shop regularly for the past several months. When Milly asks Tina if she can help a friend who needs a little advice with his children, she is eager to be of service. Tina feels God has blessed her in her career, and she loves serving the youth group at her church. but she has no idea the "friend" is the handsome farmer who provides Milly's tea shop with fresh fruits and vegetables. Zack Cooper is a single parent, doing his best to raise his teenage son and daughter on his own while taking care of a busy farm. When the kids get into minor scrapes with the law, Milly gently encourages Zack to give Tina a call before the teens land in even hotter water. At first Tina and Zack see the relationship in only a professional capacity, but soon everyone around them notices the luscious scent of romance in the air and decides to help things along. TEA FOR TWO IS A FAITH-FILLED NOVEL THAT EXPLORES THE DELIGHT OF SECOND CHANCES, WARM FRIENDSHIP, AND UNEXPECTED ROMANTIC ENCOUNTERS. Be sure to pick up your copy today and have a cup of Earl Grey or even a cup of English Breakfast Tea to enjoy with it.